Learn about case studies featuring recent, innovative implementations in several countries along with the latest trends in healthcare from GS1 Global Office. Aarhus University Hospital, Denmark’s largest hospital covers 500.000 m2, with 10.000 employees and a million patients annually. To meet regulatory expectations and facilitate traceability from the manufacturer to the hospital, logistics aggregation becomes essential for optimizing the supply chain of medicines. The first step is the implementation of aggregation on production lines and industrial processes. Boiron, the world's leading homeopathic medicine laboratory, has chosen to use GS1 standards in the implementation of aggregation. At each stage of the industrial drug distribution processes, GS1 standards make it easier to identify products and exchange information internally and externally. UDI with RIFD – launched in Japan! RFID source tagging of medical devices has started with orthopaedic devices. Standards- based encoding is essential for the effective use of RFID across the healthcare supply chain, from the device manufacturer to the hospital. GS1 Japan developed guidance about RFID encoding of UDI data in compliance with GS1's EPC Tag Data Standard (TDS). Manufacturers are increasingly leveraging this guidance to support their data. 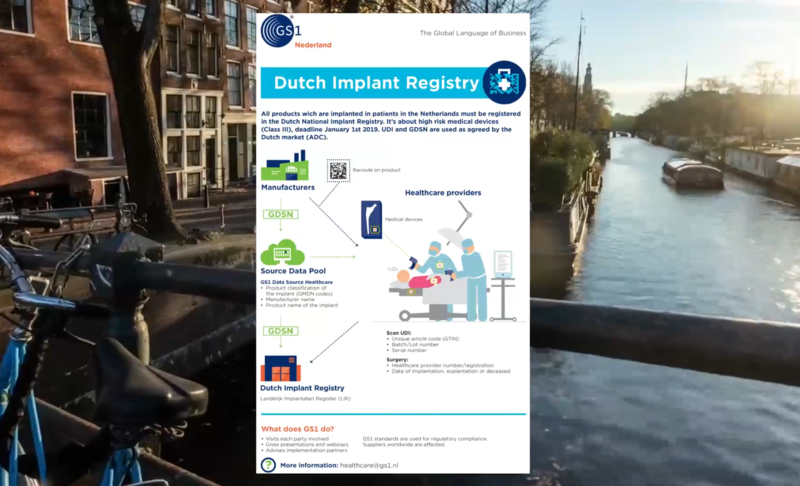 The registration of implants in the Dutch Implant Registry has been legally required in the Netherlands since 2019. To maximise patient safety, it must be possible to trace implants quickly and efficiently. The Ministry of Health has commissioned the Dutch Implant Registry. With GS1 barcodes and GS1 Data Source we can help manufacturers and healthcare providers comply with the Dutch legislation (that requires registration of implants in the registry). Adoption of GS1 standards has enabled staff at Cornwall Hospitals to eliminate ALL errors caused by incorrect patient identification and discrepancies in drug name, form and strength. Uniquely identifying and scanning the medication, patient and staff member involved, saved time and improved safety. Overall prevented error rates fell by 76% and time saved dispensing resulted in two days’ worth of time per pharmacist per month – releasing time to care. Since launching the GS1 initiative at GHSC-PSM in 2017, significant progress has been made in advancing implementation. Continuous engagement with USAID suppliers has enabled GHSC-PSM to receive GTINs for nearly 2,000 items and actively sync product master data via the GDSN with at least 5 suppliers. In March 2019, Global Fund, the Global Drug Facility, UNDP, and UNFPA aligned global standards requirements for pharmaceuticals with USAID and established their own implementation timelines. GHSC-PSM has also supported technical assistance for global standards and traceability in 10 countries, with Rwanda being the first country to publish a traceability strategy in February 2019 with GHSC-PSM support. The clinical trial industry, in conjunction with GS1, has adopted global standards for consistently identifying investigational products along the industry’s entire supply chain. The new GS1 Application Standard for the Identification of Investigational Products in Clinical Trials is intended for use by all parties involved in clinical trial processes. It defines the rules, roles, and responsibilities for the allocation of GS1 identification keys and the barcoding of investigational products, primarily from the time of kit assembly to use and, if necessary, destruction.